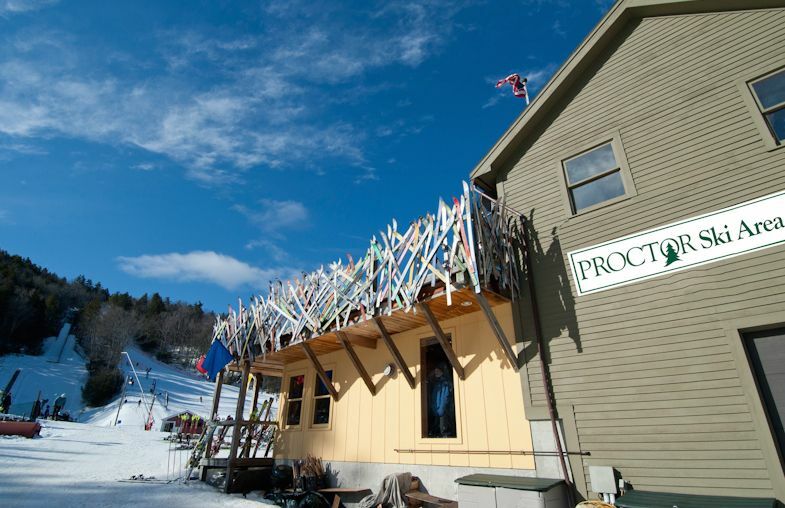 Ski Magazine and the National Association of Ski Areas recognized the Proctor Ski Area as the small ski area in North America most committed to Enviornmental Sustainability. SAVANNAH, Georgia, May 1, 2014—SKI Magazine has honored three ski areas—Steamboat, Colo., Arapahoe Basin, Colo., and Proctor Academy, N.H.—with the 2014 Golden Eagle Awards for Environmental Excellence. Additionally, SKI named Maura Olivos of Alta Ski Area in Utah as the inaugural “Hero of Sustainability” honoree for 2014.
six additional GE PF400 Power Flood Lights, bringing the total to 42. End result: a total reduction of 140 tons of CO2e, equivalent to the annual emissions from 26.5 passenger cars. Established in 1993, the Golden Eagle Awards for Environmental Excellence recognize the environmental achievements of ski areas. The awards are sponsored by SKI Magazine. Judges for this year’s awards include: Andy Bigford and Greg Ditrinco, SKI Magazine; Tiffany Beal, International Mountain Bicycling Association; Judy Dorsey, Brendle Group; Ryan Mayo, CLIF Bar & Company; Geraldine Link, NSAA; Don Dressler, USDA – Forest Service; and Kirk Mills, Colorado Department of Public Health & Environment (CDPHE). five publishing groups—the Equine Network, the Home Buyer Group, the Healthy Living Group, the Marine Group and the Outdoor Group—reach more than 20 million readers in 85 countries around the world. AIM’s titles include Backpacker, Yoga Journal, Vegetarian Times, SAIL, Log Home Living and Old House Journal. AIM was formed by Wind Point Partners, a private equity investment firm with offices in Chicago and Southfield, Mich., in partnership with CEO Efrem “Skip” Zimbalist III in October 2003.